Just when you thought it was safe to go back into the graveyard, ZOMBIETHON puts more dead bodies back into action than Frankenstein ever dreamed of, as one zombie gem after another creeps across your screen. 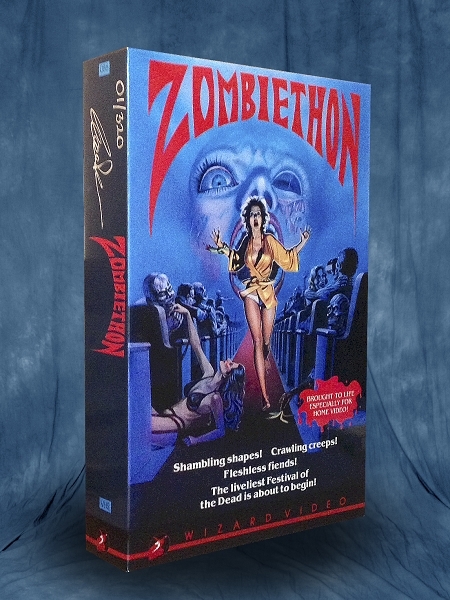 From the classic cornerstone of the undead, ZOMBIE, through the wet look of ZOMBIE LAKE and the dry look of OASIS OF THE ZOMBIES, any real horror fan will relish this smorgasbord of zombie fare. REVENGE OF THE ZOMBIES, RETURN OF THE ZOMBIES - we've got them coming and going. WHITE ZOMBIES, SPACE ZOMBIES, zombies from all walks of death. THE INVISIBLE DEAD appear by popular demand. This hysterical midnight matinee clearly shows, "Death is never having to say you're not coming back." The living dead are the living end in ZOMBIETHON.